HARRISON, N.J. – The No. 1-seed New York Red Bulls II advanced to the Eastern Conference Final of the 2016 USL Cup Playoffs with a 5-4 victory in a penalty shootout against the No. 4-seed Rochester Rhinos after the two teams had played to a 3-3 draw after regulation and overtime at Red Bull Arena. The Red Bulls II sent the game to a penalty shootout in the 119th minute on a spot kick by Brandon Allen after Rochester’s Wal Fall had put the Rhinos ahead in the extra session, and a miss to open the fourth round by the Rhinos’ Steevan Dos Santos gave the Red Bulls II's Konrad Plewa the chance to seal victory in the fifth, which he did with a slotted finish to send New York through. The Rhinos had the better of the game early on, but the Red Bulls II took the lead in the 20th minute when Derrick Etienne Jr. turned his defender and scored into the left corner. Only two minutes later, however, a quickly-taken free kick by Christian Volesky set up Dos Santos for the equalizer for the Rhinos. The Red Bulls II regained the lead a minute before halftime as Vincent Bezecourt’s low cross was put on net by Florian Valot and saved by Rhinos goalkeeper Tomas Gomez, only for Allen to tuck home the rebound. Rochester got back on the front foot to start the second half, and Dos Santos headed home his second goal of the night off a cross by Ryan James to make it 2-2 in the 55th minute. New York defender Aaron Long had a shot from close range cleared off the line by Michel Guilavogui off a corner, while Rochester’s Sean Totsch had a low shot saved by Red Bulls II goalkeeper Ryan Meara late, and New York’s Stefano Bonomo was denied by Gomez after getting in behind the defense in stoppage time, but the game remained level and headed to overtime. Rochester’s Joe Farrell headed just wide from a free kick midway through the first half of overtime, and Volesky sent a finish on frame off a corner that was tipped over the crossbar by Meara. From the ensuing corner, Fall headed home Kenardo Forbes’ delivery for his second goal of the postseason to give the Rhinos a 3-2 lead in the 110th minute. 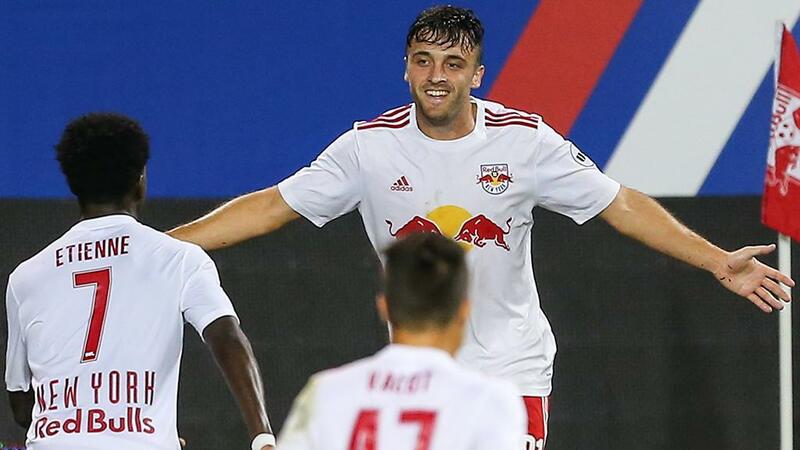 The Red Bulls II grabbed a dramatic equalizer with a minute to go, however, after Dan Metzger was brought down in the penalty area, and Allen converted from the spot to send the game to a penalty shootout, where New York would advance. 1. The Red Bulls II looked oddly out of sorts to open the game as loose passes allowed Rochester to gain the upper hand, but it didn’t prevent the hosts from taking the lead on an excellent individual move by Derrick Etienne Jr. The Rhinos caught the Red Bulls II napping moments later with a goal that would have had Coach John Wolyniec tearing his hair out, but the opening goal did appear to settle the side down, and a great move just before halftime set up Brandon Allen for a rebound finish to make it 2-1 at the break. 2. The Rochester Rhinos needed a positive reaction to start the second half after conceding just before the break, and they imposed themselves strongly on the game, which in turn led to Steevan Dos Santos’ second goal of the night. Good strikes on goal by Michel Guilavogui and Kenardo Forbes forced good saves by Red Bulls II goalkeeper Ryan Meara, but lax defending allowed Dos Santos to flick home a header from Ryan James’ cross from the right to give Rochester the boost it needed. 3. New York looked buried after Wal Fall had given the Rhinos the lead with 10 minutes to go in overtime, as Rochester packed its penalty area on subsequent set pieces and cleared the danger. But the Red Bulls II’s best player on the night came through when his side needed him most to make one final run from midfield, as U.S. U23 international Dan Metzger was brought down in the area to earn a dramatic penalty kick. Brandon Allen converted for his second goal of the night, but Metzger’s energy, and fine penalty kick in the shootout, capped an outstanding performance for the midfielder, who didn’t stop working for the side throughout the 120 minutes. Dan Metzger, New York Red Bulls II – Metzger was an absolute workhorse throughout the 120 minutes, and earned the penalty kick that ended up saving the Red Bulls II’s season as they eliminated the defending USL champions.